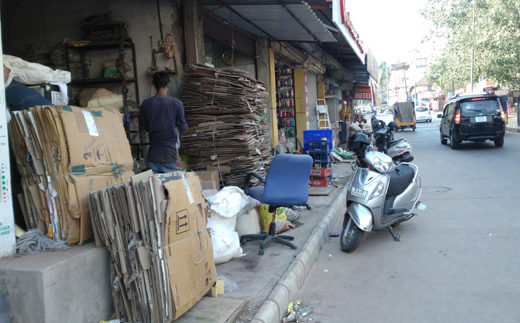 Mangaluru, Mar 19, 2019: In many vital spots on main roads of the city, there is seen consistent illegal practice of parking of vehicles, occupying near half of the concreted road. The sidewalks/foot paths are also used by shops etc...as their personal storage space- all this with the least consideration or fear of law. The shocking thing is padastrians - aged, sick and young are forced to walk on the road it self among speeding vehicles of all kinds and doging dangerously, while the vehicles hoot loudly creating fear and nervous reaction of very dangerous kind. Mangaluru City Corporation and Mangaluru City Traffic Police turn a blind eye and lock or lift vehicles only at spots not too important as in picture. The MCC has a large role in causing this situation as there is no monitoring or prevention. at a huge number of spots in the city, the bus shelters are not restored and as the summer turns harsh old, young and sick have to wait in the hot sun on the road with vehicles swishing by dangerously close, a slight error of judgement by drivers causes a major accident as frequestly seen now. 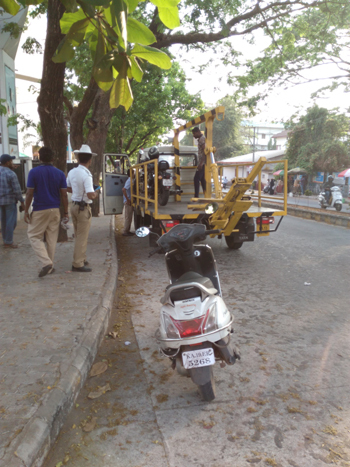 Assistant Commissioner of Police (Traffic) M. Manjunatha Shetty poited out that MCC had not providing a proper footpath in most places. If the corporation had provided a dedicated pavement, the traffic police could have ensured vehicles were not parked on it, he said. The MCC has failed and corporators too did not care inspite of peoples cries to have earmarked pedestrian space on the road flank enabling the police to act against unauthorised parking and so on. Many other poits too do not meet the law but are callously ignored. There is an Urgent need for setting matters right in this ’Smart City’ of Kudla.